…don’t pull your hair out! Help is here. 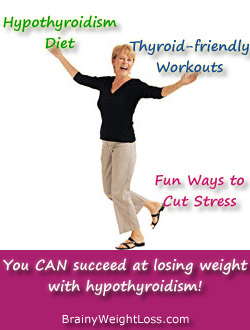 You’ll discover the connection between hypothyroidism and weight loss resistance and three steps you can take right now to reverse your underactive thyroid naturally, end your debilitating low thyroid symptoms, and drop the extra weight. So you’ll finally get your life back. …a matter of increasing your metabolism. Because thyroid hormones regulate your metabolism: the rate at which the food you eat is broken down and converted into the energy your body needs. Yes, your metabolism is greatly impacted by hypothyroidism; But this is only one factor; the other factors are totally under your control. You CAN change the rate at which your body burns food and body fat to produce energy. You CAN put an end to the low thyroid weight gain and drop the extra pounds once and for all! The most important element in reversing your hypothyroidism and weight loss resistance is to follow the best diet for hypothyroidism (if you haven’t seen it yet, check it out now and then come back here). Eat protein at each meal to help your body increase your lean muscle mass, which raises your metabolism; consider adding a whey protein shake per day (look for the pure whey protein powder, not mixed with rice or even worse, soy). Eat a high-protein breakfast early in the morning because it jump-starts your metabolism… eggs, cottage cheese, shrimps, sardines, mushrooms – or, check our thyroid-friendly coconut oil recipes. Eliminate as much as possible all sugar and refined carbs, because these simple carbs produce an insulin spike in your body, which reduces even further your already low thyroid levels; as a result, your metabolism stalls and you end up storing these high calories as body fat. Reduce complex carbs, but do NOT eliminate them completely; try to eat your thyroid-friendly carbs (the allowed fruits, rice, potatoes, carrots, beans, gluten-free cereal,) about one hour before and after your workout – this gives you the energy you need to exercise and cuts your food cravings. Eat, drink & spice it up! Losing weight with hypothyroidism requires you to eat enough to lose weight or else, starving yourself triggers the starvation mechanism, which shuts down your metabolism. But avoid snaking – try to eat only 3 meals per day (preferably at the same time each day). Do not overeat – stop eating as soon as you are not hungry any longer, instead of when you feel full. Drink plenty of herbal teas (especially energizing ginseng and mate teas) and water – add a little lemon juice and a sprinkle of cayenne powder to your water to keep your metabolism up, get toxins out of your body faster and help your liver, the fat-burning organ involved in your thyroid hormone conversion. Get friends with chili peppers and cinnamon as both are invaluable for losing weight with hypothyroidism; chili keeps your metabolism up and cinnamon lowers insulin resistance, busting your hypothyroidism and weight loss resistance. Contrary to many outdated theories (and to what you may read elsewhere on the net), strenuous exercising of any kind and long aerobic sessions are NOT helpful when you have low thyroid levels; in fact, they only aggravate your exhaustion/chronic fatigue and your body’s stress response. What you really want is an intelligent, realistic way of exercising with low energy levels (or downright exhausted), some effective exercises that are thyroid-friendly, build your energy and can be done anywhere, right? –> Do 20 minutes of strength training 3 times per week, every week. Try to do it early in the morning to crank up your metabolic rate and burn fat for the next 24 hours. Strength/resistance training grows your lean muscle tissue and, as a result, boosts your metabolism, because muscle burns up to 9 times more calories than body fat. Choose your favorite workout: lift weights, use resistance bands or go for an equipment-free calisthenics routine (bodyweight workouts). –> On alternating days, do a mind-body workout for 30 minutes to help restore your hormonal and mental balance and re-set your weight set point to a lower value (so that once you lose the extra pounds you will not gain them back). Consider any of the popular mind-body routines: tai-chi, qi-gong, yoga, or try the famous energizing and hormone-stimulating Five Tibetan Exercises, which you can do anywhere, no matter your weight or fitness level. We’re almost done – let’s just cover briefly the last step you need to take to break the low thyroid weight gain cycle. Whenever you need to raise your low thyroid levels you must reduce stress as much as you can – all kinds of stresses, internal and external. That’s because stress causes an increased production of fat-storing hormones that hinder your metabolism and further lowers your thyroid function. You’ll say that it’s simply not possible to remove stress completely, right? But do the best you can – along with your mind-body exercising routine, which helps calming your mind try some other fun ways to relieve stress. Follow these three steps of losing weight with hypothyroidism and you’ll see the results showing up on your bathroom scale in no time! I encourage you to take your health in your own hands. Knowledge is power; empower yourself by finding out everything you can about hypothyroidism. Take a look at the Hypothyroidism Revolution program. …you’ll get the info you need to reverse your low thyroid weight gain along with practical, natural solutions that are safe for you. Personally, I feel this is the best guide on how to deal with hypothyroidism and weight loss resistance because it gives you the most comprehensive low thyroid healing protocol in a 3-phase, step-by-step format, including meal plans, grocery shopping lists, diet calculators, thyroid-boosting exercises and easy-to-do recipes to eat your way back to health. 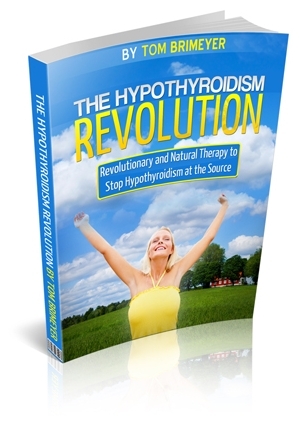 Hypothyroidism Revolution is a comprehensive, practical plan; a clear roadmap to reversing your low thyroid levels naturally and start losing weight immediately. It was put together and refined by Tom Brimeyer, a Functional Medicine practitioner and an expert on hormones and losing weight with hypothyroidism. Last I checked Tom offered complimentary email coaching with his program (which elsewhere is more than the cost of this program); but as you can imagine, this kind of personalized support is offered on a first-come-first-served basis – check to see if it’s still available. 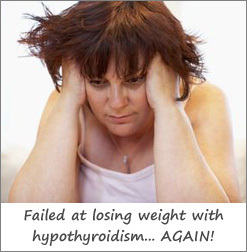 So take a look now at Losing Weight with Hypothyroidism Revolution and see if this is something you’d like to try!